The Association for Insurance Leadership (AIL) is the industry’s only organization exclusively for the leaders of independent employee benefits practices. Full membership is limited to owners & principals of independent benefits agencies and benefits practice leaders at independent P&C agencies. The mission of the AIL is simple: Elevate the industry…by supporting and equipping the current and future leaders of independent benefits practices. The AIL has adopted a “Today & Tomorrow” strategy to elevate the industry, effecting positive change now while working to ensure a positive future. 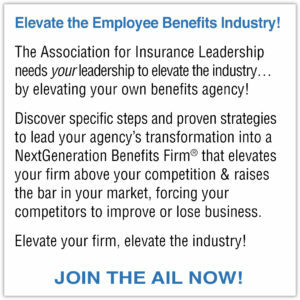 The AIL works to elevate the industry today by elevating & equipping the leaders of individual agencies to transform their agency into a NextGeneration Benefits Firm®. The AIL works to elevate the industry tomorrow by elevating & equipping the Emerging Leaders of AIL Member Firms who will provide the future leadership of their firms and our industry. The NextGeneration Benefits Firm® business model elevates the industry today by creating benefits firms that provide employers with valuable business solutions, including better and more cost-effective employee benefits. Elevating individual agencies into NextGeneration Benefits Firms starts with you and your agency. When you transform your agency into a NextGeneration Benefits Firm, you raise the bar in your market. When your agency becomes more competitive and more effective, your competitors either improve or lose business. By elevating your own firm, you elevate the industry. As this process is repeated across the country, the industry is continuously and increasingly elevated. While the NextGeneration Benefits Firm® business model is the template for elevating & equipping agencies, the NextGeneration Leadership® program is the template for elevating & equipping Emerging Leaders. The goal of the NextGeneration Leadership® program is to add NextGen thinking and strategies to the valuable mentoring that agency leaders are providing their Emerging Leaders, so that this next generation of agency leaders can build on the achievements of their mentors to grow their agency and take it to the next level. If your agency has one or more Emerging Leaders, this program will help prepare them to lead your firm in the future. If you are looking for that next generation of leadership, the NextGeneration Leadership® program can help you identify and recruit those younger candidates. Through Association programs and training, AIL Members and their Emerging Leaders learn key business-building strategies, develop stronger leadership skills, collaborate to share their collective wisdom & best practices, expand their solutions portfolio, and enhance their results for their clients. As AIL members elevate their own agencies and as Emerging Leaders enter the industry and are trained and mentored to become NextGeneration Leaders®, the employee benefits industry will emerge from the shadows of its current crisis to the sunlight of a bright future. We invite you to step up now and lend your leadership to our mission to elevate the industry. 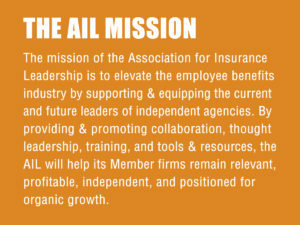 Join us on our mission as a member of the Association for Insurance Leadership!